Vijay Starts Production Company Named “Ghilli Films”? Much was expected when Karthika, daughter of yesteryear glam heroine Radha made her flashy entry with a Jiiva-starrer Ko in K.V. Anand’s direction. While the film did wonders to Jiiva’s career, Karthika could not a make it big despite the fact that she was critically acclaimed for her performance. Finally there’s good news for the actress! Reliable sources say that none other than Ilayathalapathy Vijay for a film has roped her, which will be produced by his newly formed banner Ghilli Films. 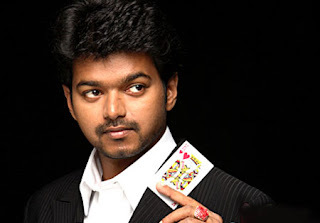 Vijay is restricting himself to production and Vikram Prabhu, son of veteran actor Prabhu will play the male lead. Interestingly the Velayudham star has chosen to remake the 1981 blockbuster movie Sattam Oru Iruttarai as his first project. Apparently, the movie was directed by his dad S.A. Chandrashekar and featured Vijayakanth and Poornima in the lead. After SOI’s release Vijayakanth became one of the leading stars in Tamil cinema. The remake version, it is said will be directed by debutant Ramesh. 0 comments for "Vijay Starts Production Company Named “Ghilli Films”?"